Croft & Barrow Women’s Navy & White Print Classic Fit Stretch Skort, Size 6. 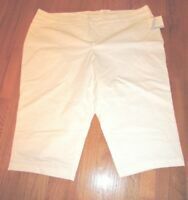 Croft & Barrow Women's size 16P Capri Jeans Petite Excellent Condition. Style: Skort Exact Length: 18.5 "